As a bearer of hope for peace and better times, Volvo presented the PV444 at the large Volvo exhibition in Stockholm, in September 1944. The price was very attractive - 4,800 Swedish crowns, the same as for the ÷V4, Volvos first car in 1927. The appearance of the 444 was influenced by American styling. This car was the first Volvo to have a unitary body without a separate frame. It was also equipped with a laminated windscreen, an important new safety innovation. Interest was enormous and the original planned production figure of 8,000 cars became almost 200,000 before the PV444 became the PV544. 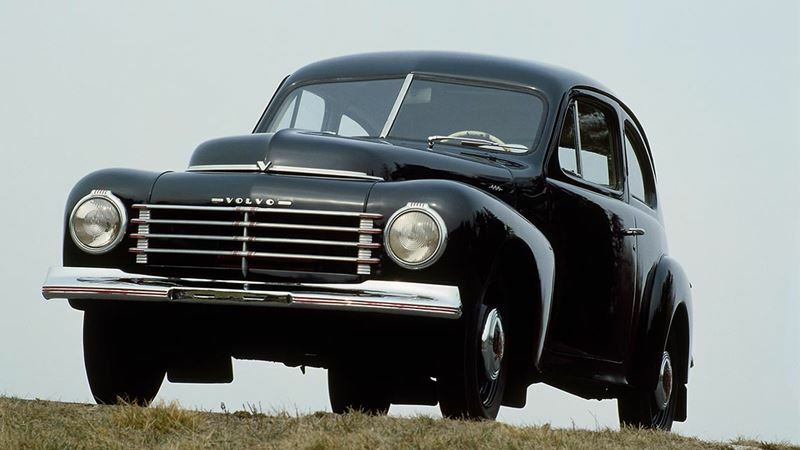 The 444 was the first small Volvo car and the one which really set car production at Volvo moving. In-line, 4-cylinder, 1,414 cc (86 cu in); 44 bhp. 3-speed with floor-mounted gear lever. Wheelbase 102 in; weight 1,960 lbs when empty.